The objective of this agreement is to provide Bremerton Public Works & Utilities (PW&U) with accurate forest stand information to maximize water protection, revenue production, and water production within the specified constraints for the duration of the planning period. Primary constraints include, but are not limited to: Surface Water Treatment Rule (SWTR); Forest Practices Regulations; and sustained yield harvest principals. This information is intended to update and supplement constraints and information contained in the December 1996 Utility and Forest Land Management Plans. 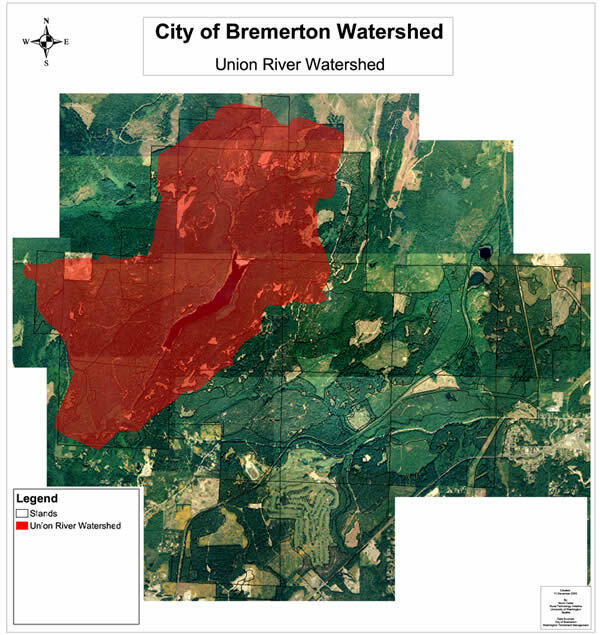 The objective of the attached proposal is to provide Bremerton Public Works and Utilities (PW&U) with accurate forest stand information to best manage the forest resource on a sustainable basis for water protection, revenue production, and water production within specified constraints into the future. The University of Washington, College of Forest Resources, Rural Technology Initiative (RTI) will use forest inventory, geographical, historical, and other information as data inputs for the Landscape Management System (LMS©), a publicly available forestry software program, and ArcView©, a proprietary Geographical Information System (GIS) program, in collaboration with the PW&U Forestry Division and other consultants, to create an assessment of current and future conditions on Water Utility forestlands under different management approaches. Alternative approaches to meeting the multiple-use goals of PW&U for these forestlands will be developed and evaluated on a temporal and spatial basis using a combination of ecological and economic models. A report on comparisons of alternate management approaches will result and be provided to PW&U. The report will include estimates of sustainable harvest volumes as well as other pertinent metrics of forest resource analysis associated with PW&U management goals. RTI will also train PW&U personnel in the use of LMS and provide the PW&U Forester copies of the LMS software as well as electronic versions of all data and mapping capabilities generated from this project. The planning horizon will be 50 years developed in 5-year management cycles. The Bremerton Water Utility owns 8,186 acres of land in Kitsap County that were originally purchased and are managed to protect and enhance the water quality and resource for public water supply. Most of this Water Utility land is located within the contiguous ownership of 7,660 acres. The major drainages within these lands are the Union River, and Gorst Creek. The City prepared a comprehensive Plan to manage these lands in 1986 and an update to the Plan in 1996. As part of the 1996 planning effort, a field inventory of forest resources was conducted and digital mapping capability, through the use of GIS, was established. An examination of the 1996 field inventory data indicates that the Utility has 7,108 acres of land in forest. The soils and climate are conducive to production of timber resources. In 1996, the average site index from King Site Index (King, 1966) was determined to be 106, which is a medium site class III. The slope of the land ranges from 0 to 60% with predominant south and southwest facing slopes. Of paramount concern to the City of Bremerton PW&U is the continued high quality of its surface water resources. The Water Utility operates the Union River Reservoir as an unfiltered surface water supply that provides for 60% of customer water use. The remaining 40% is taken from 12 wells located on Utility lands outside of the Union River Basin. To continue to operate as an unfiltered source, the Water Utility must maintain source water quality as defined by a number of state and federal regulations. In 1996, the Utility Land Management Plan estimated, that if water quality declined below required surface water standards, the PW&U could be required under law to build a filtration plant. The estimated costs of a filtration plant at that time were $12 million for construction and $1.3 million annually in operation and maintenance costs. Timber harvest activities provide the PW&U with substantial revenues ($1-1.5 million annually) that are dedicated primarily to reduction of Utility operating expenses. The result is considerable ratepayer savings. Logging activities conducted in the Union River Basin, however, may be limited to insure adequate protection of the unfiltered status of the Union River water source. The forest management term used most often to refer to an individual management unit or area is stand. Forest stands may be as small as less than an acre or as big as several hundred acres. For GIS purposes, stands may be referred to as polygons. When developing management plans for forested landscapes, the characteristics of multiple stands must be considered. The majority of the forestland base is covered with second growth forest (96%) with an average age of 50 years. These forests were naturally regenerated as a result of a combination of logging and fire activity. Douglas-fir is the dominant tree species present accounting for 79% of the inventory. The remaining tree species are western hemlock (11%), red alder (7%), big leaf maple (2%), western red cedar (1%), and a small component of western white pine and black cottonwood. For many years, laminated root disease, which attacks Douglas-fir trees, was found to be a problem throughout the utility lands. Since the writing of the 1996 Plan, the major thrust of forest harvest activities has been the removal of trees (primarily Douglas-fir) from areas infected by root rot. Species, such as red cedar, western white pine, western hemlock, and alder that are resistant to root disease, were propogated in harvested root rot pockets. Today much of the root rot infestation has been controlled. Since 1996, substantial changes to the Forest Practices Regulations of Washington State have been made to protect native fish and water quality. The current regulations are referred to as the Forest and Fish Rules. Regulatory changes include new protocols for stream typing and riparian buffer delineations. As a result of these new regulations, a larger portion of the forest area within Utility owned forests, than was expected in 1996, could be unavailable for timber harvest. Other protected species can also impact availability of stands for harvest. As the forest becomes older, larger portions of the forests will need to be scheduled for final harvest and regeneration. The scheduling and location of such harvest activities may be sensitive to a wide assortment of issues including impacts to surface water turbidity and impacts to viewscapes. The 58,000 residents that are served by the City of Bremerton Water Utility enjoy the benefits of unfiltered clean water delivered to their homes at rates well below what neighboring community water customers are required to pay. Receipts from the sale of forest products have historically generated $1-1.5 million annually in fiscal return to the Water Utility. These revenues are primarily used to reduce expenses for the water system and lessen the level of user rate increases. Presently most of the forest is mature; a strategy to broaden the distribution of ages classes and species mixtures may be desirable to help insure a future sustainable flow of revenues from harvest activities. Because of the above-mentioned issues and other challenges to forest management such as maintenance of sites for biosolids applications and reservoir/intake protection areas, there is need for PW&U to reassess and update forest resource planning. Developments in technology will be helpful to such a process. The objective is to provide PW&U with accurate forest stand information and alternative landscape management plans to maximize water protection, revenue production, and water production within specified constraints for the duration of the planning period. Management of forest resources under variable and sometimes conflicting objectives has become complex and problematic. At the University of Washington, College of Forest Resources, there is a program designed to utilize the latest science and best technology to assist forest managers and decision makers in the creation of forest plans. This program is called the Rural Technology Initiative (RTI). RTI has assembled a team of professional scientists, staff, and graduate students to utilize and develop software-modeling capabilities in support of problem solving for complicated natural resource management challenges. Software capabilities include the Landscape Management System (LMS), a publicly available forestry software package developed at the UW. LMS utilizes forest inventory data and GIS layers to create a virtual model of the forest landscape. Incorporated in LMS are growth and yield models, analytical programs, and visualization capabilities from both the stand and the landscape perspective. Another important software program utilized by RTI in the development of alternative forest plans is the virtual mapping program, ArcView, developed by the Environmental Systems Research Institute (ESRI). ArcView technology allows the operator to create spatial simulations such as viewscapes and riparian buffer overlays. Such combined capabilities bring needed powerful modeling and analytical support to the forest planning process. It is the objective of this proposal that RTI personnel work directly with PW&U staff to develop alternative landscape plans for the forestlands owned and managed by the Water Utility. A range of management alternatives and inventory information updated from the 1996 Land and Forest Management Plans and the accompanying 2000 Addendum will be helpful to PW&U as new decisions are needed concerning the intensity of forest management within the watershed. All new information derived from this project is primarily for the benefit of PW&U managers and staff but may be secondarily beneficial to help members of the public to better understand forest management issues on Water Utility lands. The planning horizon will be 50 years examined in 5-year growth and operational cycles. Goals and constraints within water supply areas are unique. Therefore this project will treat the PW&U forestlands as two distinct watershed-planning units, “Union River” Forestlands and “Other” Lands. PW&U has provided a preliminary set of goals and constraints unique to each planning unit. Union River Forestlands: The Water Utility currently owns 2,777 acres in the Union River drainage basin. The Union River Basin is heavily forested and the composition of the forest and vegetation is greatly influenced by previous logging and fire history. Much of the timber is 50–60 years old. The Union River and minor creeks in the drainage convey water to the Union River Reservoir from which water is drawn for municipal consumption. The primary goal of this watershed planning area is to maintain the present unfiltered status of the surface water supply through meeting requirements of federal and state regulations. The secondary goals include forest health, annual timber revenues, and sustainable volumes of harvestable timber supply. Constraints to timber management include surface water quality and treatment regulations, other regulations such as state forest practice regulations, current distributions of stand ages and characteristics, spatial proximity of forest stands to reservoir/intakes, topographical limitations on operations, and viewscape concerns. Other Lands: In 1997, based on GIS analysis, the Water Utility estimated that PW&U lands outside of the Union River Forestlands comprised 5,409 acres. These lands are Gorst Creek Drainage Basin (2892 acres), Heins Creek Drainage Basin (435 acres), Anderson Creek Drainage Basin (347 acres), and other scattered parcels (1,735 acres). Within these drainages are located 12 wells from which PW&U extracts 40% of its available water supply. Since protection of surface water is not as critical of a concern for this area, PW&U has identified the generation of sustainable income from timber harvest activities as the primary management goal for these forestlands. Forest health and transitional strategies toward future sustainability of harvest volumes through age class distribution adjustments are important goals here as well. Unique to this area is the practice of recycling biosolids from the City wastewater treatment plant to produce soil improvements and increased forest productivity while disposing of wastewater. The City has estimated that its program for the application of biosolids (currently on about 430 acres) saves the City approximately $200,000 annually. Identified to be considered, as management constraints on timber harvest within these lands are regulations, stand characteristics, financial needs/markets, the need for appropriate forest conditions in adequate supply for use as biosolid application sites, and concerns over viewscape quality. Modern forest management planning processes for the integration of multiple values that maximize prioritized outputs have been aided tremendously by developments in Geographical Information System (GIS) technologies. Spatial issues such as road distributions, stand inventory locations, stream buffers, sediment flows, unstable slopes, wildlife habitat areas, and others can be examined with unprecedented analytical capability. The result is more accurate predictability of environmental consequences associated with management choices and subsequently greater operational efficiencies. In this project, the RTI GIS Specialist will work with PW&U to assemble all useful mapping layers and orthophotos for virtual spatial analysis for the Bremerton PW&U. This spatial database will be linked with inventory information. Individual management unit polygons (stands) will be delineated for all operationally unique areas located within the two PW&U planning units (landscapes). Outputs from growth and yield simulations for each planning period and for selected proposed management alternatives will be presented with spatial reference. All mapping capabilities that are generated as part of this project will be made available to the PW&U Forest Manager. Suggested management alternatives will involve in-depth analysis of specific consequences and tradeoffs of various management actions. Management alternatives will need to be spatially and temporally sensitive. It has been identified as an important objective of the PW&U, for example, that harvest volumes and revenues associated with timber management be sustainable into the future. Estimation of such output flows through time will require sophisticated modeling and analytical capabilities. The Landscape Management System (LMS) has been developed at the University of Washington for just this purpose. LMS is a computerized system that integrates landscape level spatial information, stand-level inventory data, and individual tree growth models to project changes through time across forested landscapes. LMS coordinates the execution and information flow between many different computer programs (40+). These programs: format, classify, summarize, and export information; project tree growth and snag decay; manipulate stand inventories; and present stand and landscape level visualization and graphics. The two virtual planning units, Union River Forestlands and Other Lands, will be created as LMS “portfolios” which will be made up of all stand polygon information associated with each of the two planning units (landscape areas). RTI staff will work with PW&U and other consultants to assemble all needed data for the preparation of two LMS portfolios for PW&U forestlands designated for investigation. Most forest inventory information available for the study areas is from fieldwork accomplished as part of the planning process in 1996. This data will be “grown” forward used the Pacific Northwest Variant of the Forest Vegetation Simulator (FVS), a regional growth model. In areas where harvest activities have occurred with the last six years some new inventory data has been collected and will be used. Where inventory data is found to be insufficient RTI staff will work with PW&U to generate needed information. Two portfolios will be created from which to develop alternative management approaches for PW&U use. Upon completion of portfolio construction for Union River Forestlands and Other Lands, RTI staff will work with PW&U to develop and model alternative approaches for the management of the two planning units for 50 years. Outputs from the modeled alternatives will be presented in 5-year increments. These 5-year increments will be considered as management cycles. Objectives of all management alternatives to be developed for the two planning units will be reflective of the stated objectives of the Water Utility. All alternatives will be designed to protect City water quality and to meet the requirements of all applicable laws. Differences in alternative approaches will reflect a variety of strategies conceived to maximize desired outputs within the operational opportunities and constraints identified by the Water Utility. Alternatives will be evaluated relative to metrics of economic and ecological performance over time. A market assessment of potential forest outputs will characterize transitional issues required to reach sustainable levels of income and harvest volumes as well as the ability to cover management costs while producing reasonable returns to the Utility. The economic activity produced by operations will also support the local economy while contributing to improved environmental amenities. Pertinent to examination of sustainable timber harvest flows will be issues of age class distribution and future land use conversion. Different estimations of the impacts of these two issues will be incorporated into the management alternatives. Active management and rotation age adjustments can interact to produce a shifting mosaic of forest conditions. Visualizations, graphical analysis, and mapping imagery for each management scenario will be made to aid Utility managers in determining and understanding the consequences and/or tradeoffs of each alternative. Simulations of alternatives for comparison will be conducted on 5-year growth cycles for a total planning period of 50 years. It is the suggestion of the project team that, in the spirit of adaptive management, 5-year intervals are appropriate periods of time to anticipate a need for revisitation of all planning assumptions and output estimates. However, since a goal of this project is to plan for a transition of activities within the forestland base towards output levels of enduring sustainability, a longer time frame than one growth cycle is needed for strategic investigation. Fifty years was selected as the planning cycle for this project to be representative of the time interval from regeneration to final harvest for an idealized forest stand within the watershed. Fifty years is also a sufficient time period to begin to see the implications of adjustments to age class distributions and species mixtures to estimates of revenue and harvest flow sustainability.